It's an uncharacteristically simple outfit today! 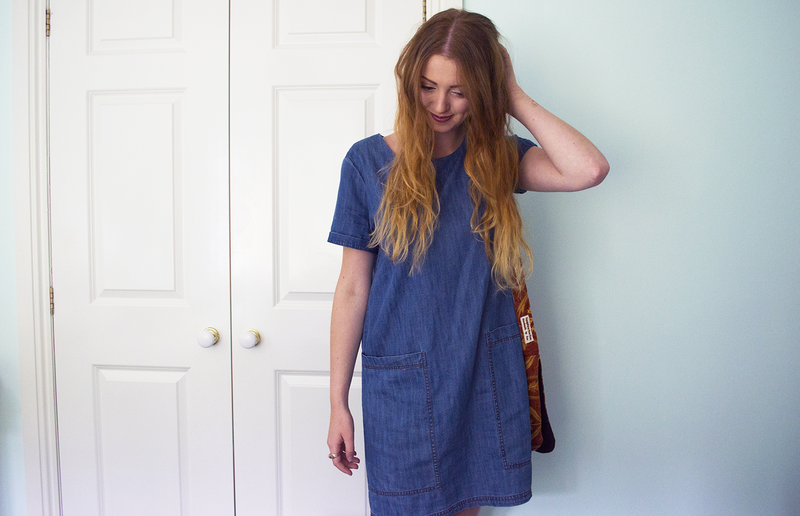 Denim's just perfect for Autumn, isn't it? Not that I've made my peace with the fact that Summer's over, fingers crossed for a mild September/October. 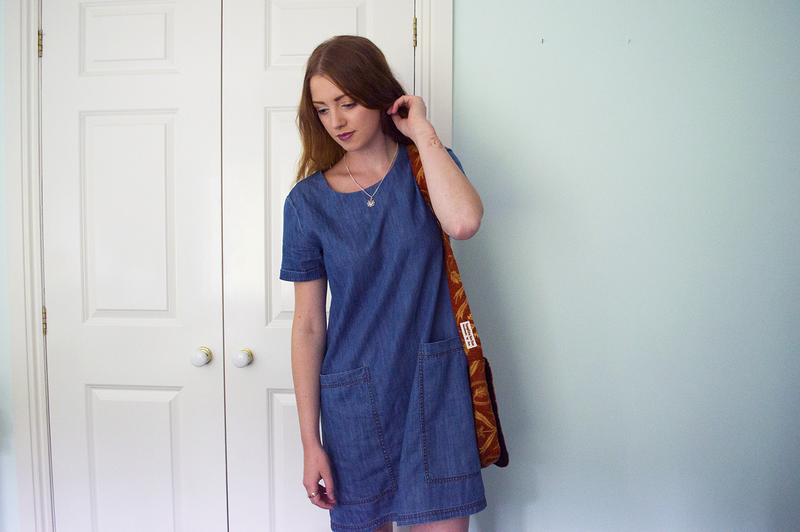 But anyway, I think denim dresses are great for transitioning to slightly cooler weather - they offer a bit more warmth than floaty summer fabrics, without getting too sombre. This bag is rather special (to me, at least). Again, it's fairly simple, but I spotted it at a farmer's market in Dolgellau, a little town in Snowdonia. It was on a stall run by a woman from a local farm, and though there were a few other bags in different patterns there (my mum picked one up too), she told me this was the first one she'd ever made. 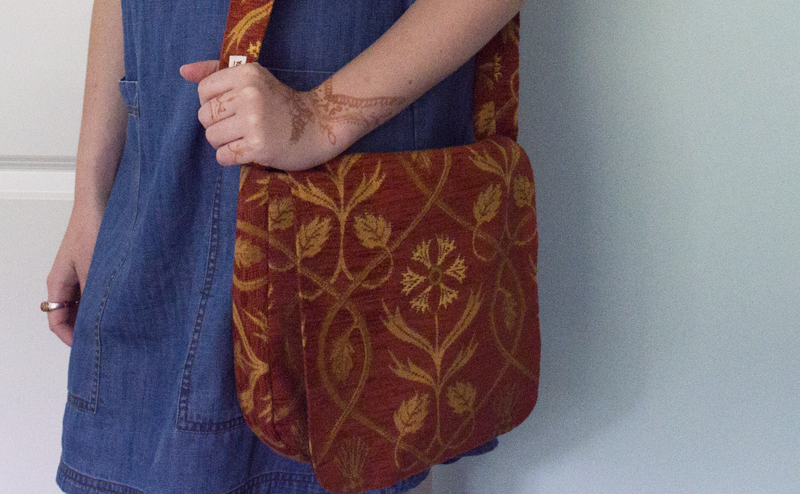 I thought the fabric was gorgeous, and the bag is so well made, I couldn't resist. Unsurprisingly, the seller has gone on to make a lot more bags and textile pieces, though still on a mostly local scale - take a look at her facebook page, Sabina's Sewing Room. A couple of other little things to mention here: yes, those are the remnants of a henna design on my hand. I've wanted to try doing my own henna for a while, so I bought some cheap cones that had good reviews (here) and I've been using any festival/event as an excuse to try them out. It's harder than I thought to draw designs with the cones, and I've by no means mastered it yet, but I haven't made a complete mess of my skin either so I'm going to count that as a success! You may have also noticed (if you've read any of my older posts) that my hair colour has changed quite substantially. It's gone from being dark reddish brown to a sort of blonde/light brown ombre. This started as an impulsive decision to bleach the tips of my dark hair, in order to be able to use some of the Bleach London colours on it for Glastonbury. However, the bleaching didn't go exactly to plan, and I was left with gingery tips, which meant my hair looked a little odd at Glasto. Afterwards, I gave my hair a week or two to recover, then tried bleaching again, using a balayage technique to blend the blonde and brown sections of my hair together and to take the lighter tones much higher up. The result? Well, as you can see, I really am quite blonde (or, perhaps more accurately, bronde) now. And I like it. It's been a fun change for the summer. I've always wanted to try going blonde for a bit, just to see if it would suit me, but I won't keep it forever. I'm actually kind of missing my brunette locks already, so I'll probably blend in darker tones slowly from the roots through Autumn/Winter. Have you ever had to fix a hair dying disaster? For a while, I was terrified that my hair wouldn't be able to take the bleach and would all break off - cue lots of deep conditioning treatments! Hair looks good, and that smile is just so cute. 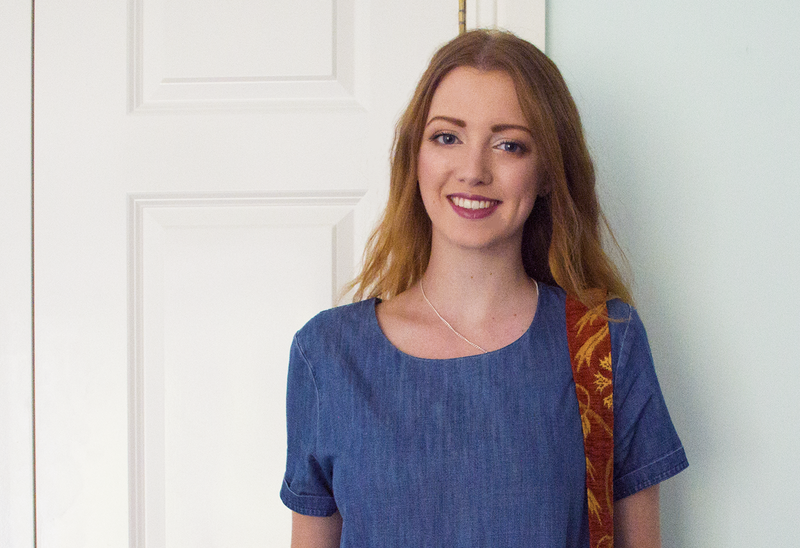 I love your bag, it is so different to anything I have seen on the high street. I like how simple and elegant this outfit is, yet still classic and elegant. Lovely post. I think your hair looks great!! Your dress is also really cute, such a wardrobe staple.